A modestly sized locket that is small enough to be a delicate item of jewellery, yet big enough to be used practically. The heart shape is a classical design remaining popular and fashionable from generation to generation. A highly desirable item of jewellery. The shine on your lockets can be easily maintained with a suitable silver Polish cloth which removes any excess tarnish that may build up over long periods. £11.95 - A heart shaped locket of outstanding quality. This silver locket has an inner frame to hold small pictures in place (hover over the image to open locket). You can store a wide range of little mementos. The outer case has been highly polished to produce a bright and romantic locket. A practical as well as a pretty little piece of jewellery. 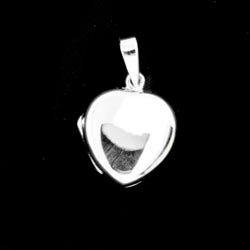 The locket measures 15 mm Wide by 15 mm High. Its ring clasp will accommodate a chain or thong of up to 4 mm. The highly polished silver has been hand-crafted to produce an exquisite locket that makes a lovely present of silver jewellery at any time of the year. Its weight is approximately 2 grams.